It has been way too long since I've participated in Baked Sunday Mornings! There were a few recipes that I wanted to make and didn't have time, a few that didn't interest me, and at least one that I made and was too lazy to post. Sawdust Pie caught my eye because it's the creation of a restaurant here in Kentucky, Patti's 1880's Settlement. I've been to Patti's once and it was fabulous. Delicious bread cooked and served in terra cotta pots is served with strawberry butter and their signature 2" pork chop is legendary. I would love to go back someday and try some of their other specialties. 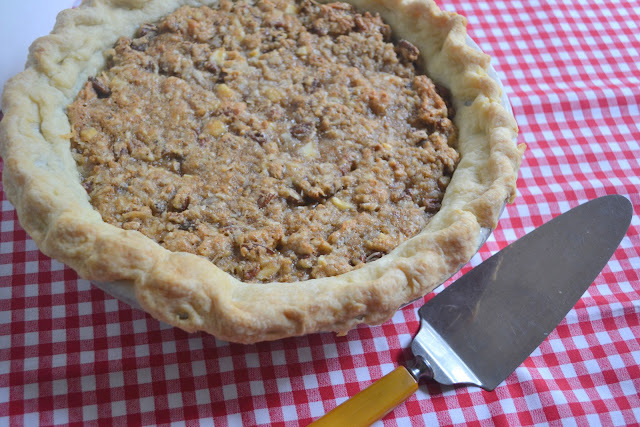 This pie is sort of a cross between a pecan pie and german chocolate frosting. Its name comes from the addition of graham cracker crumbs, that when you think about it, do look an awful lot like sawdust. The rest of the filling is made up of pecans, coconut, brown sugar, egg whites, and white chocolate. It took every ounce of discipline I have (which isn't much) not to use chocolate chips instead of white chocolate. While I like white chocolate in certain applications, I find it can be too rich and sweet. I'm glad I stuck to the recipe as written but would have preferred some milk or semi-sweet chocolate instead. Delicious, rich, familiar yet a little different, Sawdust Pie will have you going back for a second slice. To find the recipe, visit Baked Sunday Mornings. You did a great job representing Kentucky! And now you make me want to visit Patti's 1880's Settlement -- yum!! She used semi-sweet morsels in hers.. so I don't think there's any "written in stone" law that says you can't. Yay, Candy! Glad to see you back & glad you enjoyed the pie - it was really different & good. I need to get to Patti's sometime! Your pie looks delicious!